Federal Reserve by Josh, CC-BY-ND. We noted earlier that the government has two ways of influencing the economy. The first was fiscal policy by which the government raises or lowers the federal budget deficit. The second, which we will introduce in this module, is monetary policy, which is how a special part of the government called a central bank regulates the availability of credit and regulates the banking system. 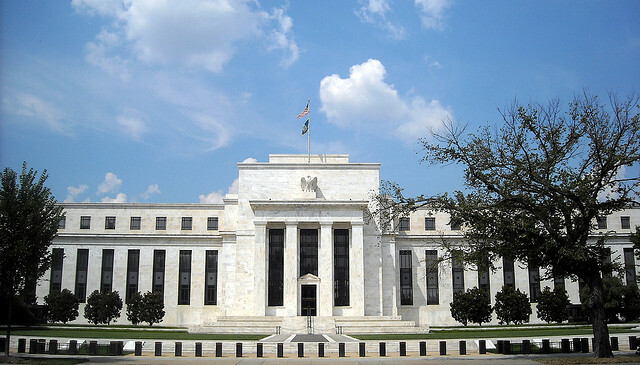 The central bank of the United States is the Federal Reserve System (or Fed). As this is written, interest rates have been unusually low for several years. Some are barely above zero. This is not so good for savers, but it is very good for borrowers. If you are interested in getting a loan to buy a car or getting a mortgage to buy a house, you probably wonder when interest rates will start rising back to “normal,” higher levels. If you are saving for retirement, low interest rates mean you may have to work more years to save up that nest egg, so you also want to know when interest rates will increase again. After completing this module, you should have a good understanding of how to answer these questions.